Spice up your bag selection by taking a trip on the wild side! Take advantage of one of the most popular design options today. 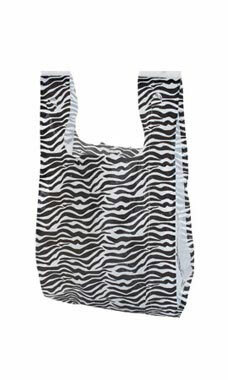 Our zebra printed plastic handle "t-shirt" style bags are one of the most common and economical packaging solutions. Our T-Shirt Bags are durable high density polyethylene plastic (HDPE). We offer our zebra bags in two popular sizes for use in a variety of applications. When paired with our bagging stand (90110) the bags can also be a great addition for use at craft fairs, specialty boutiques and gift shops. Our bags are sold in cases of 1,000.